Roberto Firmino or Bobby as he is known is a very unique attacker and while I'll admit I'm biased, he's clearly one of the top attackers in the world who'd walk into any side. Sure his finishing might not be natural like some elite level strikers but his all around game is typically better than most as his work rate, creativity and desire to lead from the front makes him special. 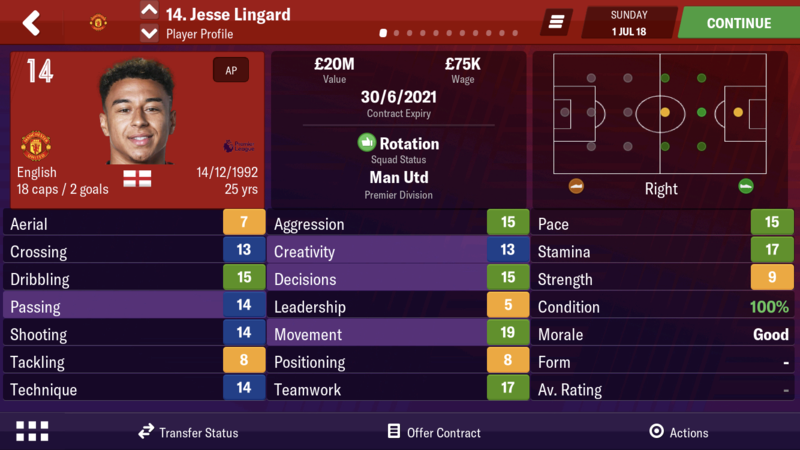 This makes him a fascinating case study for looking at his development across FMM as a series and I'm writing this because I've witnessed his development rather closely year to year, due to doing this I've noticed how crazy his changes are game to game and I've decided to showcase them to you today. 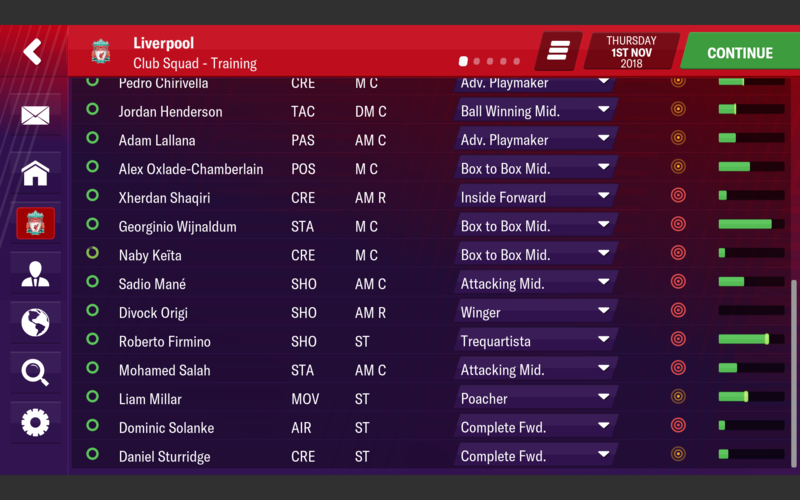 I have easy access to the mobile versions of FMH/FMM from 2013 up until the recent release of 2019 (I'm only missing 2012) so let's deep dive into the Liverpool forwards attribute history. 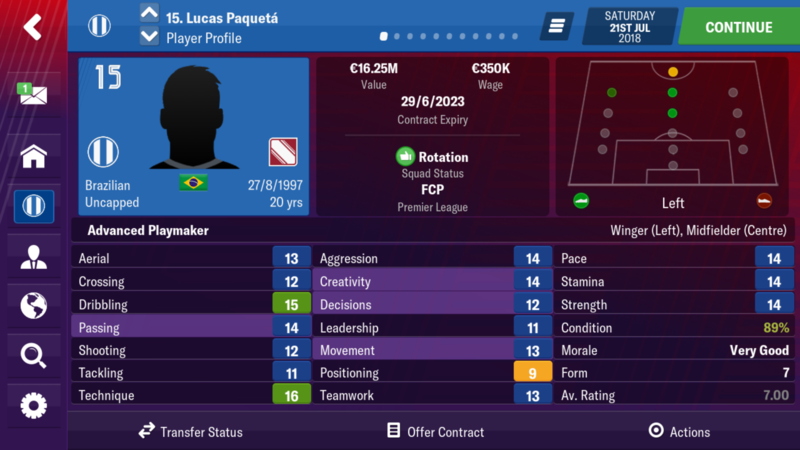 At just 20 years of age the Brazilian looks a special talent as he has lovely looking greens in key areas for his creative midfield role. His creativity, movement, passing and dribbling are excellent and should only improve with age. 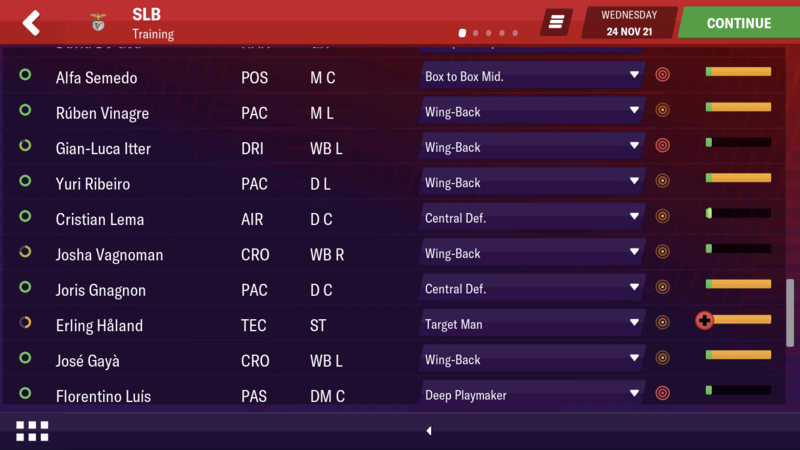 In real life Bobby played 36 times for his club side scoring 7 times which was slightly worse than his previous season of 7 goals in 33 fixtures, however for a 20 year old these are excellent stats. On FMH 2014 Firmino saw no real improvement however it was this year where Bobby really stole the show in Germany as he upped his goal out put to a stellar 22 goals in 37 appearances! Thanks to his outstanding season Firmino saw massive upgrades to his day one stats as now the 22 year old looks the real deal! He's gained some important greens with others growing higher towards the max limit of 20 which made him one of the stand out talents on the game that year. 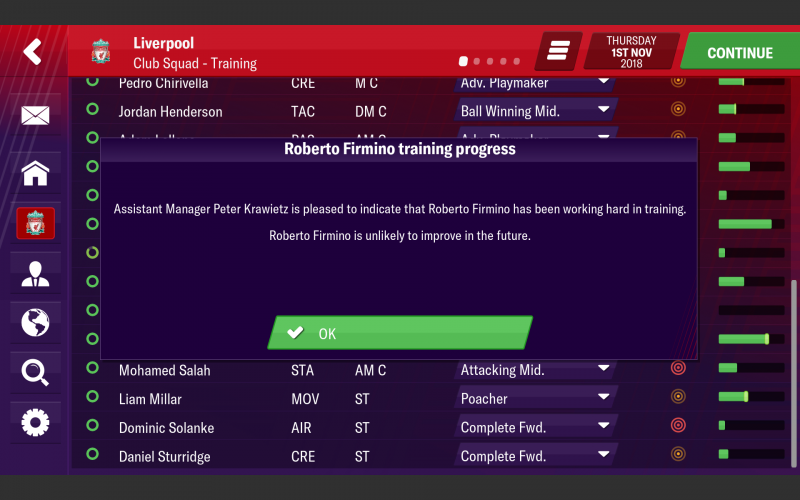 Unfortunately however Firmino failed to match his previous season in real life as he finished the season with 10 goals from 36 appearances. Liverpool however weren't put off by last season's blip as they splashed the cash to make Firmino a Red! Unfortunately the Brazilians stats took a hit but interestingly the player is now an accomplished striker and not just the midfielder he'd been in previous versions of the game. Firmino struggled at first under Rodgers at Liverpool but he had a decent enough debut season in England scoring 11 times in 49 appearances but it's fair to say his output improved once Klopp was brought in. Oh? What's happened here then? The 2015 and 2016 versions of Bobby appear a distant memory at this point as the Brazilian has seen a number of downgrades across his spread, most noticeably his creativity, shooting, passing and physicals have took a knock (apart from his strength). Thankfully SI corrected their mistake in the January update as the Brazilian was now back with a more striker like spread compared to the original release. 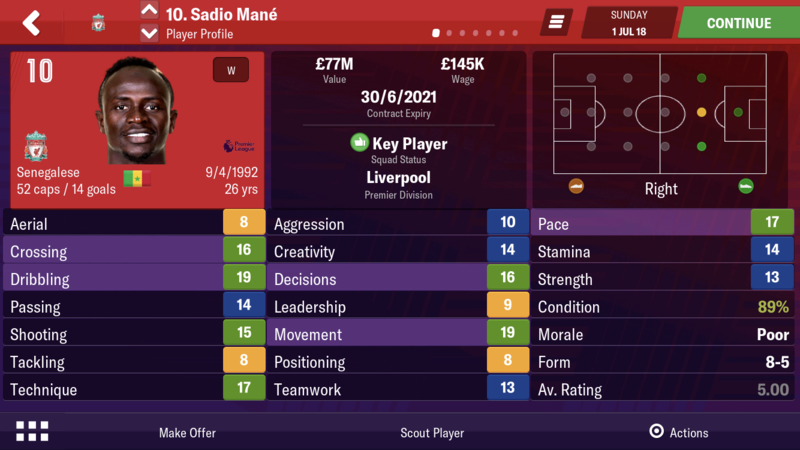 I would however say his creative stats for a deeper position aren't really that enticing, he's really in positional limbo for me. Anyway his second season under the Anfield lights was a more productive one as he netted 12 times in 41 matches. Firmino's average goal return in the previous year saw the Brazilian take his hardest hit yet as he looks a shadow of his former self. Admittedly there are a number of high blues there but he's once again not really a winger, not really a striker and not really an attacking midfielder. What have they done to him! My poor, poor Bobby! The greens are long gone now with the Liverpool strikers defining attributes being his touch/control, stamina and work rate. You might be thinking Firmino had a poor 2017/18 to justify this heart break? Well unfortunately he only managed to score 27 goals and rack up 17 assists in 54 appearances. Surely after a stellar campaign like that Firmino will be back to his best.....Right? I know I was hoping for the best ever version of Firmino! Yes.....Kind of! The greens have returned yet he's still not really a striker or midfielder compared to most other in game options, you can easily find better for each role as Firmino is neither! Don't get me wrong 13-15's aren't bad and they will improve with training but let's look at some other players on 2019 shall we. Salah and Mane rounded out Liverpool's unstoppable trio last season and just look how immense those two are! Especially compared to Firmino who is essentially Liverpool's style of play. 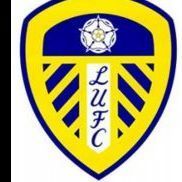 Do the stats justify this massive difference between the three? In short not really at all! Salah is heads and shoulders ahead in a shots/goals sense but based on their Premier League performances everything else is pretty even. You wouldn't look at this and associate it with his FMM stats page anyway, especially compared to some of these stupidly over powered kids available. I also made a throw away comment to @Nucleus who inspired this article by showing me a few LFC screenies last night that I bet a certain decent at best Manchester United attacker would look better than Firmino, but was I right? What About Some Random Wonder Kid? 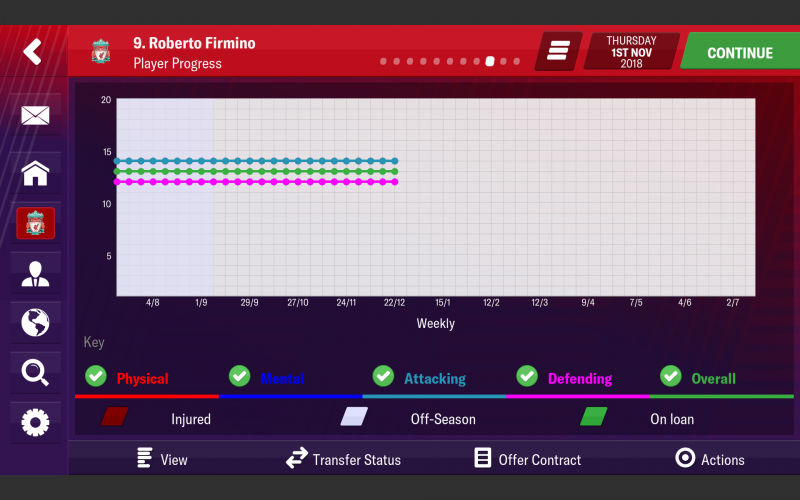 Every release in recent years I've found myself disappointed in Firmino as he's neither here or there in what his stats suit in game, he's incredibly underrated in both positions and as I've shown his stats are up and down like a yoyo. He's easily replaceable by basically any more specialist player which is devastating as Bobby should be special like he is in real life. Granted I understand his key attributes in real life might not transition well into the game (even if I think his stamina is also too low as he tires quickly) but he's a better attacking mid or striker than FMM let's on in my opinion. Hopefully you enjoyed watching his transition or maybe you're also frustrated by how he is in game. To be fair saying training will improve him is correct however it will also improve any player that already out classes him so I don't think that's the take away from this. As always thank you for viewing and I'd appreciate any thoughts and opinions. That is really strange when you look back at the game through the years and see how he has altered and really not been improved despite him being when of the premier leagues most feared players. He is also crucial to how Liverpool play imo and helps get the best from both Mane and Salah. 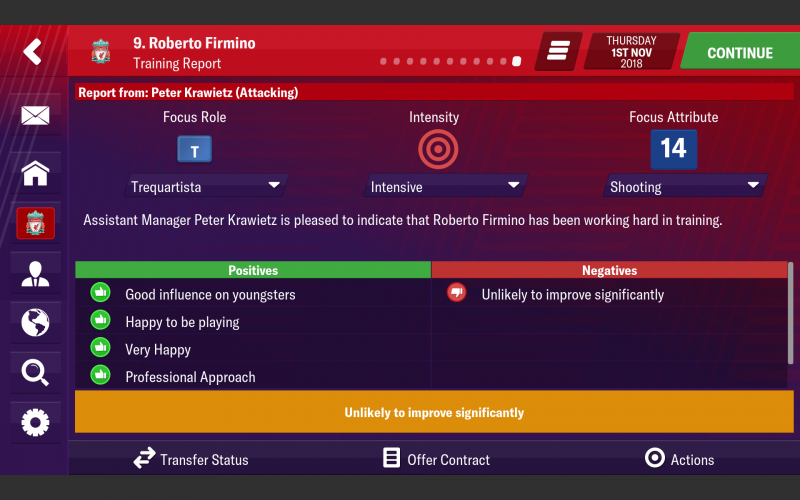 I used Bobby a lot last year when testing our Gegenpressing tactic (Link here if anyone wants to test it on FMM19) and found him to be a quality shadow striker so it’s not like he can’t do a job in the game. Interesting read! For a player as good as he can be, he does seem quite underrated by the game. Especially when you see him compared to others! Ha I knew what this article would be! Great to see some old school screenshots from previous years....hurry up and download the game so the fun can begin! Interesting to see if SI upgrade him in jan update? Great article, I agree that his attributes are underwhelming. 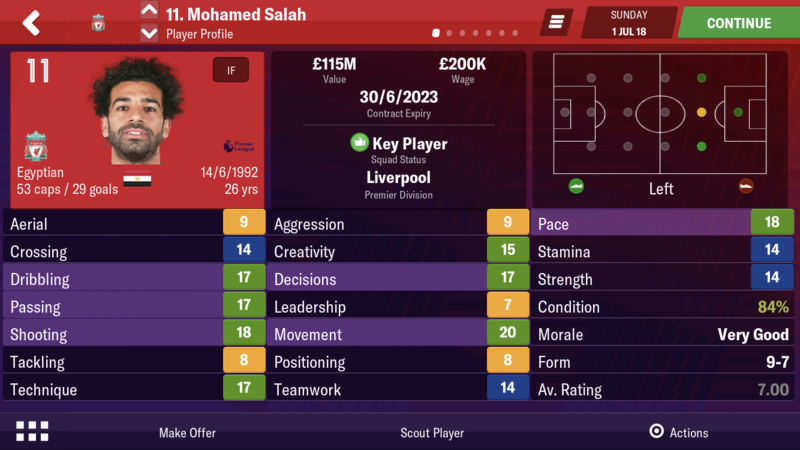 Suprisingly his value is 86m, in line with top tier players. I was really hoping he would be better this year but again I'm disappointed. He should be much better. That's the thing, his strength is his versatility. I do like his plentiful blue's and a couple of those turning green would make him look massively better. Then again, you know as well as I do that there's a world of difference between green 15s - 16s and green 19s - 20s. I too struggle to identify what his best spot/role in a formation would be tbh. I think in FMM, he'd be my ideal 12th man replacing any forward that needed subbing. Yeah, I think that's the kicker as so many players out class him. Wanted day one images but that was shocking! Yeah, it doesn't add up! 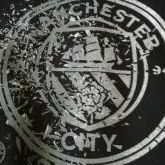 Absolutely cracking article Ash. Such a shame that his attributes have taken a bit of a beating. Let's hope he will get a boost in January . I highly doubt he will be improved in the update. If he was going to get a boost (which he definitely should have had) he would have got it at the start on this years game. Look at how good he is in real life. It's farcical to think the best he has been was in FMH2015! For anyone interested in trying to save Firmino I simply wouldn't bother as apparently he's peaked. This training is utter garbage. What’s his progress bar look like? Flatter than my interest in this system. So he can improve, once that green bar reaches the end he’ll get a boost in his attributes. One point in shooting wouldn't save him either way though tbh. So by that logic training a player as an AF or P and then an additional focus on shooting should see that attribute grow in the same way and that should work with any technical attribute if you get the role trained and the additional focus combination correct? Tbh this just 100% proves my point that there is no reason to use Firmino or older players as WKs will out class them in no time. Four points is a gigantic amount in FMM stat terms. That’s what I’ve gathered so far. Myself and @PriZe have both experimented with doing it with the TM role with additional focus on Aerial. I managed to raise a players Aerial from 8 to 20 in 6 months and Prize managed the same with a different player.